Lewis' shoot was one that my team and I had plenty of time to plan for. His schedule is super packed with touring shows he performs all over the country year round so finding time when he is actually in NY and available isn't easy. We shot about ten months after I first brainstormed ideas with him. 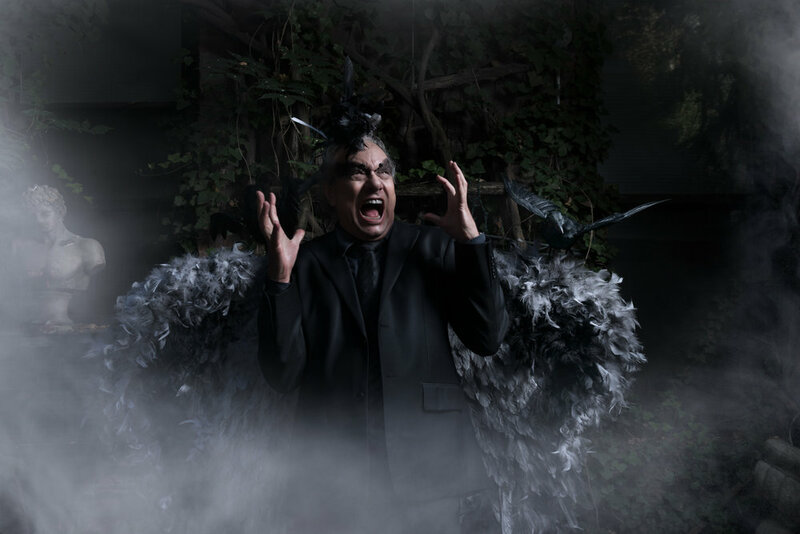 Once the concept was set, costume designer Stevie Ondra designed his angel wings to go along with the rest of his look. She painstakingly glued each feather, and painted the wings to match the color scheme of the character. 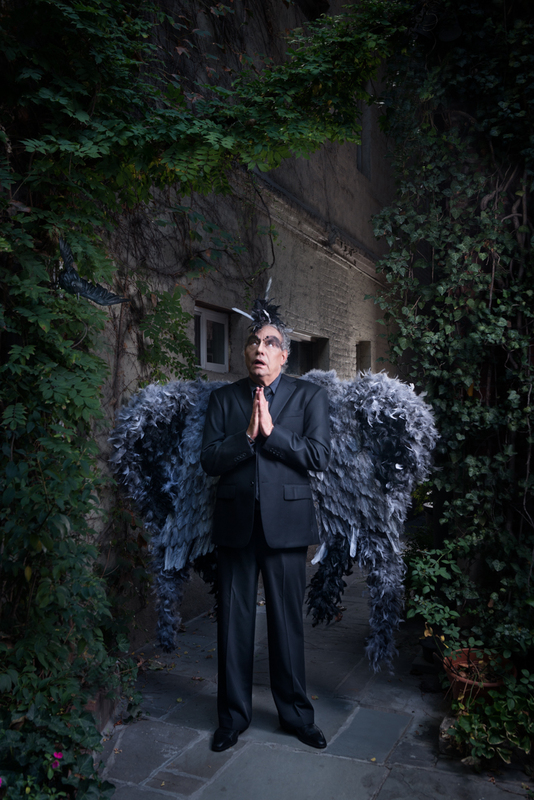 Even though he is a black angel, we didn’t want black wings. For one, because that would be a too dead on, but more importantly we didn’t want the wings black because that wouldn’t photograph well. We just needed that dark feel, so Stevie painted the wings with variations that created rich depth and interest, with a slight tint of purplish blue. Artist Mari O'Connor custom made a headpiece (of art) using the same feathers to complete the look. 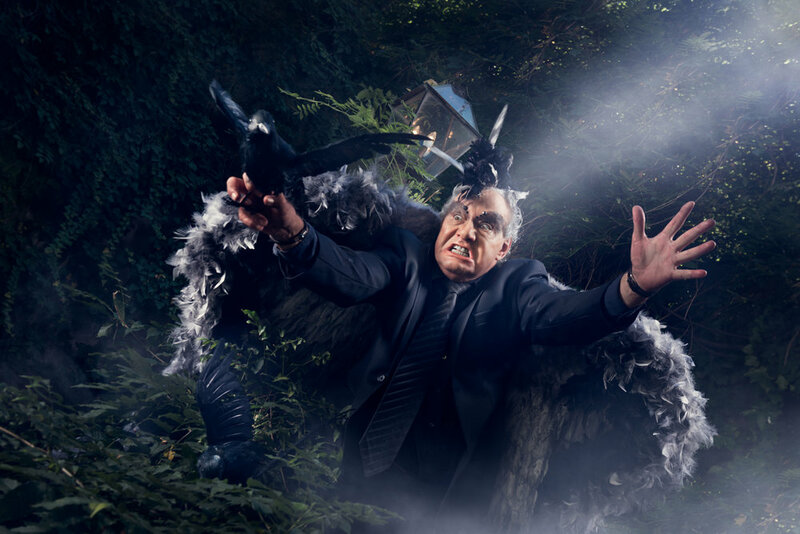 I only own one Broncolor (Siros L) strobe so it was super helpful when Jim Reed from Broncolor provided an additional one, which we used to backlight Lewis and the alleyway. The day of the shoot was a humid, scorching eighty-something degrees one. Not ideal when shooting outdoors around noon, but we made it work with a lot of cold water for everyone and a fan. Spirits were high, the whole team pulled through, just like the real pro’s they are. Finding the location was the hardest thing about this shoot. I had a very clear vision in mind, but it wasn't easy finding that apocalyptic, overgrown alley in NYC. 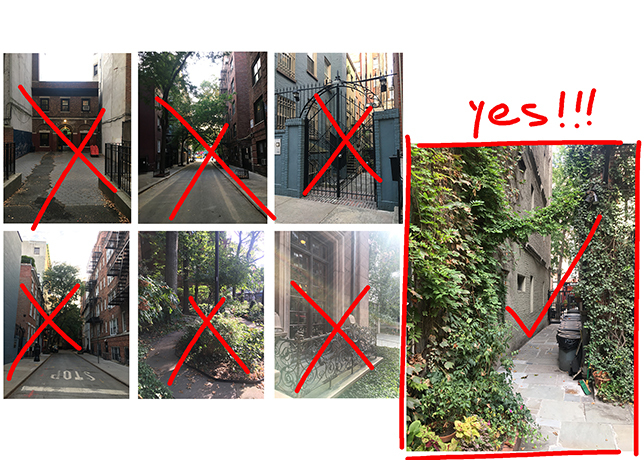 I searched all over the city, when at the last minute I came across an article about a historic alley in NYC, which was used in many films, most recently a Woody Alan film. I was at the mercy of the residence owners or manager, I wasn’t even sure who will talk to me. I immediately went down there to inquire. Luckily but not surprisingly, the owners are awesome people and huge Lewis Black fans (who isn’t?) so that really helped. For this shoot, you can see my very simple setup in the BTS video. I used two strobes, mostly to overpower the very bright sunny day, and to have more control over ambient Vs. strobe. Image #1 I used one strobe to camera right with a small soft box and a grid that I just riggd to fit the small box since I do not own one that fits that box. It worked just fine. I placed another light behind Lewis in the alleyway, to light both the allyway and Lewis' back to give more depth and definition. Image #2 One strobe to camera left, to light Lewis's right side, and another strobe at the top of the balcony, pointing down towards Lewis. Image #3 I used one strobe with the same small soft box setup to camera right, and another strobe with a rectangular box placed to my left back.